With the 2014 MLS draft coming to a close last week it's the end to another college/development season for North American soccer. The second part of the draft was interesting, including Canadian clubs doing well with the biggest steal of the draft potentially Pete Caringi taken by the Montreal Impact in the third round. While younger players are still playing youth soccer, many are now participating in the US Soccer Development Academy, including future Home Grown Players (HGP) for a number of MLS affiliated clubs. College players continue with school and have some spring practice, optional PDL in the summer and return to play next fall. Before I complete my college/development coverage I thought that it would be important to reflect on the top Canadian talent from the past season, including two players who ended up being drafted in the later rounds. This is my first version of the NCAA Division One Men's Soccer All-Canadian team. According to my data, there was over 120 players competing in NCAA Division One who were recruited via Canada. With the continued issues, discussions and debates surrounding the Canadian National Team, here is a list of players who can potentially add to a player pool that has always lacked depth. MacLeod is a redshirt freshman for Iowa-based Drake University after sitting out his first season of college. The 6'3 Waterloo native played his first 17 college games as the starting keeper in 2013 and finished with a 1.15 goals against average and .809 save percentage, which was 33rd highest in NCAA Division 1 soccer. MacLeod could play three more seasons in college and although Drake is a smaller school he could establish himself as one of the top goalkeeping prospect in the 2017 MLS Draft. A Vancouver Whitecaps residency player, Quinton Duncan played 20 games as a true freshman this past season at Tulsa University. Duncan is 6'0 and was asked to play centre back, although if he wants to establish himself as a prospect in this position he will need to bulk up for his listed weight at 155 pounds. Quinton should play in some high profile games next season as Tulsa already has two 2015 draft prospects in Cristian Mata and Akeil Barrett and can also see time with the Canadian youth national team. I already have Ononye in my top 100 prospects for the 2015 MLS Draft. Ononye has great size at 6'3/191 and has college experience playing both centre back and defensive midfielder, and established himself as an All-Horizon League Honors player. The Richmond Hill, Ontario native might struggle getting attention, as his school Wright State doesn't play the most high profile schedule, however, if invited to next season's MLS combine he should grab the attention of the coaches and scouts. 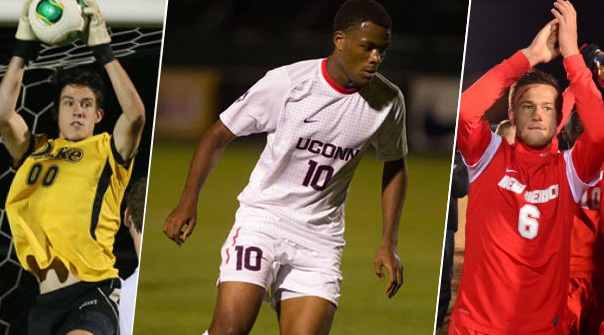 UCONN should be the college team to follow next season, from a Canada perspective, with Larin, Goodridge, Matheson and Kwame Awuah all coming from the Toronto region. Awuah plays full-back/wing at UCONN and as a true freshman played in all of UCONN 23 games last season starting 22. Awuah's biggest issue regarding a pro/national team career is his size listed only 5'7/145 pounds. Traditionally UCONN is one of the stronger schools in NCAA soccer, so if Awuah can start all four seasons with the Huskies, he should have a good reputation for the 2017 MLS draft. Outside of Larin, Sergio Camargo might be the most familiar player to Ontario based soccer fans as he played with Toronto FC in the 2012 Liverpool friendly, was TFC Academy MVP, as well part of the Canadian U17 and U20 teams. Camargo started well in his college career scoring nine goals and five assists in 24 games, starting 15 of them as a freshman. Sergio should remain a key player at Coastal Carolina, pile up the offensive numbers and might also leave school early signing with Toronto FC as a home grown player. Another Toronto FC academy player and Canadian national team player, and despite Chapmen being a junior next season, he's projected as one of the top candidates for leaving school early and joining either TFC as a Homegrown Player or as a GA pick in the draft. The 6'0/150 Campbellford, Ontario native has scored seven goals and five goals in 43 career college games so far, but what makes him a pro prospect is his ability to play with the ball at his feet, which means he offers a MLS club more than your typical college midfielder. McKendry is a Vancouver Whitecaps academy player who could have joined the Whitecaps senior team the past two seasons. The 5'11/150 midfielder already has 12 goals and 3 assists in 44 games at New Mexico and should be a key team leader for the Lobos next season. McKendry has had a great reputation as a youth player in BC winning multiple awards, as well as playing games with both the U18 and U20 Canadian national team. McKendry's potential future partnership in central midfield with Will Johnson could help give Canada the spine needed to develop a productive midfield. Although not drafted, Zadro was my top Canadian senior in NCAA Division 1 this past season. Unlike Ongaro and Pridham, Zadro lead his school Wisconsin to the National Tournament. Zadro has a lot of positives with good size at 6'3/175 and an ability to cross the ball, which led to many assists in college. Tomislav did have issues with injuries and also had to start his college career in Junior College which probably hurt his chances for a guarantee pro contract. I hope he get chances with MLS and NASL clubs this preseason as I think he has the tools to be a professional player. Ongaro was one of the top goal scorers in the most difficult conference in college the past two seasons, scoring 17 goals with San Diego State against mostly PAC-12 opposition, but unfortunately most of those games were also losses. The 6'0/175 striker has experience with both the U17 and U20 Canadian national teams and has shown the ability to be a poacher, which meant Montreal drafted him 67th overall. However, I don't think he has the skill set that a MLS club requires. This being said I wouldn't be surprised if he plays professionally next season with his hometown club FC Edmonton. Pridham earned a reputation for being a player at the right spot in his opponent's 18 yard box, which help him score 25 goals in his last two seasons of college, including 14 in 2013. The Toronto native has good size at 6'1/180 and also some Canadian national team experience. However, he didn't make the U-20 team and further questions remain about his pro ability when Montreal choose to draft his Cal Poly team mate instead of him. Eventually drafted by the Whitecaps in the 4th round and 58th overall, Pridham will need to take his opportunities with Vancouver to gain a roster spot. Cyle Larin might be the most exciting men's soccer prospect coming out of Canada since Junior Hoilett, and unfortunately from a Canadian perspective, he left his options open regarding his pro career and playing for Canada. However, he did join Canada's most recent national team training camp. The true freshman took full advantage of an injury to fellow UCONN striker Mamadou Diouf and scored 14 goals, 3 assists, via 44 shots on goal in 23 games. Larin has all the tools you like in a prospect, size 6'2/190, athleticism and an ability to perform in pressure situations and if he accepted a GA spot for the 2014 draft he would have been a top three pick. Some honorable mentions are UCONN striker Allando Matheson who scored seven goals off the bench and should be a starter next season; Duke striker and Whitecaps Home Grown prospect Brody Huitema who scored 6 goals in his freshman season; Saint Bonaventure senior Emmett O'Conner who scored 8 goals including 4 game winners; South Florida defender Nikola Paunic; Syracuse midfielder Jordan Murrell; Washington forward Josh Heard; Robert Morris forward Bruce Cullen and UAB midfielder senior Chase Wickham who all played key roles for their schools throughout the 2013 NCAA Division 1 season.